Starting a podcast is a powerful, high-investment way to grow your network and build your network in a specific niche. Plus, if you enjoy talking to interesting people, it’s a great way to have fun while working. It’s one of the ways I encourage people to get started on building out their personal brand. I’ve run a few podcasts myself and still can turn to many of the guests I’ve talked to for resources today. Here’s a good article on all the tools you need to get started. This does not mean that the best guest is the one with the biggest profile. 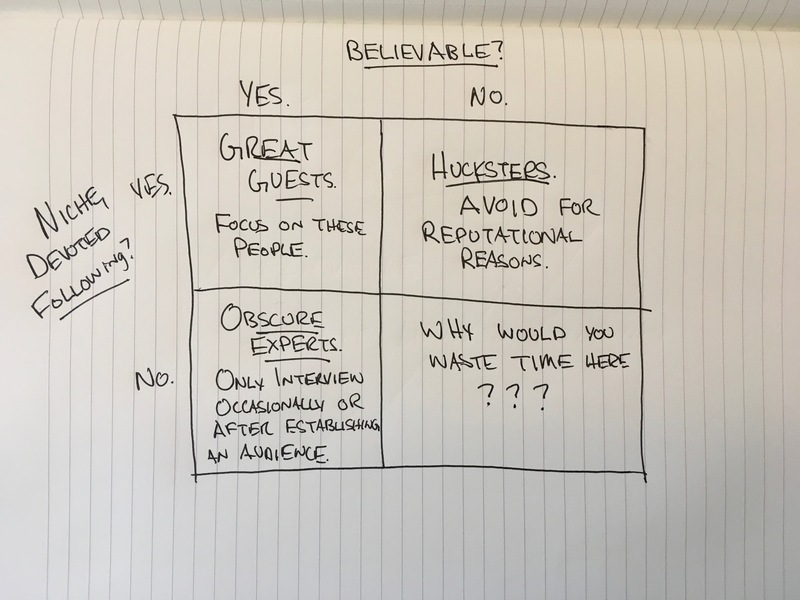 High-profile guests have high opportunity cost, take months to book (if you can get them at all), and often are too busy or too saturated to promote your podcast widely. It’s better for you to get these people to feature you down the road rather than focus on landing them now. When making a list of prospective guests for your podcast, ask yourself if they’ve accomplished the thing you want to ask them about and have demonstrated that they can explain the relationships behind their conclusions. Find previous interviews they’ve done, articles they’ve written, or talks they’ve given to back up your belief in their believability. This research will also help you when you reach out to them to invite them on your show. Here’s my guide to researching people on major platforms before reaching out to them. A great guest doesn’t have to have a huge following. You won’t be able to land most people with huge followings at first, anyway. Instead, focus on the niche and the devotion of the following first. Just because somebody has a lot of followers on Twitter or Quora doesn’t mean that they have a quality following, though. Look to see how strong engagement is with their posts and if those engagements are real, quality replies and RTs (on twitter), or just bots. These people are fine to interview but don’t make them the focus of your show. If every interview is with an obscure expert while you yourself are still relatively obscure, nobody listens to the show. Tim Ferriss can interview once-obscure experts like Jocko Willink because he’s freaking Tim Ferriss. He pretty much invented the entire field of podcasting. I’ve heard that most podcasts stop after six episodes. I can’t find a citation for that claim but it sounds right to me. Launching a podcast is a lot of work. Doing it every week (or month, or every other week) is even more work. You don’t want to triumphantly launch a podcast and then scramble to put together more interviews. 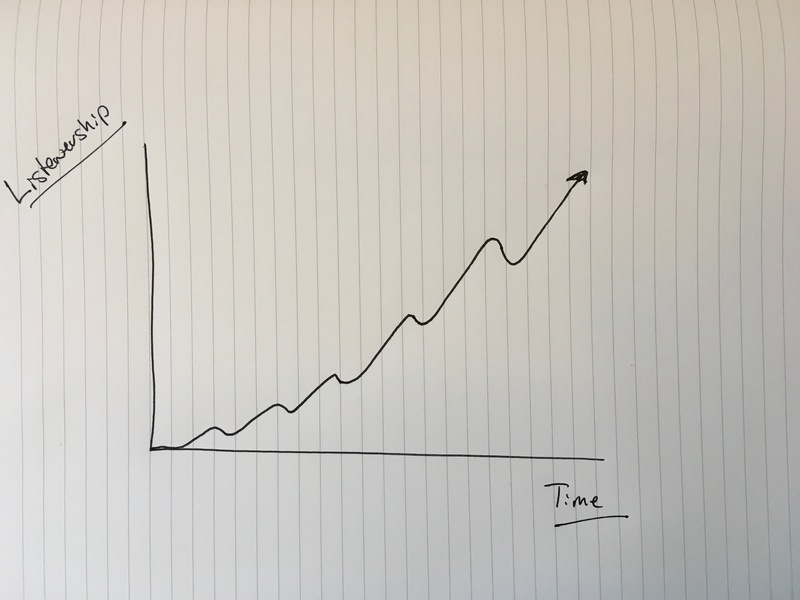 Scheduling outreach takes time. Doing the interviews takes time. Getting people on the show takes time. Keep track of the contact info of prospective guests, what their affiliation is, and sources you can cite as to why you want to have them on. Sources are previous interviews, articles, books, or any other resource that lets you show them that you know something about them and aren’t just blasting out the same invite to every person. The answer depends on whom you’re pitching. If you’re pitching a high profile person, you probably won’t convince them to come on your podcast yet. If you’re pitching a lower profile person, you can get them on your podcast by showing them that you have a specific reason to have them on and by flipping the script. Don’t mislead guests. Don’t tell them you have a bigger listenership than you do. Don’t make them think that going on your show will result in a ton of traffic that won’t actually generate. Instead, be transparent and honest with them. Let them know you’re just starting out. And let them know that you plan on doing the podcast for at least some time and you would be honored to have them as an inaugural guest. My name is [your name] and I am the host of [your podcast name], a podcast about [something relevant to their specific niche]. I’d like to invite you to join our show. I found you on [platform, media, other podcast]. Our target audience would be interested in your work with [very specific, cited example of why they are relevant to your show. If they are a cryptographer and you run a crypto podcast, for example, show that you’ve done some research on their cryptography work. Do not pick the most recent example you can find. Give them reason to believe you actually know more about them]. We’re just launching the podcast and, so our listenership is still growing. I’d like to have you on as an early guest, though, because I want to lead with quality guests early in the show instead of just bringing on the easiest-to-get people. I know you’re very busy, so I’d understand if you had to decline. Tweak this to your own writing voice as you see fit. Notice that it doesn’t end with “let me know,” or some other fluffy, non-question ask. There’s a very specific ask for a very specific amount of their time. They can reply “yeah, sure,” or they can reply, “no thanks” while walking through the airport on their phone. Great! We’re looking forward to having you on. As I noted before, interviews are completed via [Skype, Zoom, etc.] and last [x] minutes. Please choose a time where you’d be available to take the interview on your computer. You give them a specific set of times to choose from because it is easier for people to query their minds or calendars for specific times than to think generally, “am I free Tuesday?” You may feel like you’re being polite letting them choose a time but it actually creates more work for them. After a guest records an interview with them, send them a follow up. Mention at the end of the interview that you’ll do so and you’ll ask them for referrals. Our episode should be live [date range]. I’ll send you an email when it goes live so that you can listen. Like I said at the end of the call, I’m always looking for new podcast guests. Do you know two people who [specific qualifications that make it easy for the guest to know exactly to whom to introduce you]? The important point about referral emails is that you make it ridiculously easy for them to know who to refer. Don’t say, “if you know anybody else who I should interview, let me know!” No! That doesn’t tell them anything about the kind of person who should be on your show. It puts a ton of work on them. Don’t do that to your guests. If you’re going to do a podcast, do it right. Front-loading this kind of research and outreach will make maintaining the podcast considerably easier on you.